From speaking to our clients, a couple of features that they love and find them extremely useful are attaching photos and capturing customer signatures when they complete a job. They can then email all the details to the customers straight away or if they are connected to them, they can log in and view them themselves. What are the advantages of taking photos and capturing signatures? 1. By attaching photos before work is done, it helps to support and justify the amount of work and materials needed and more importantly to agree on the cost before work is carried out. 2. 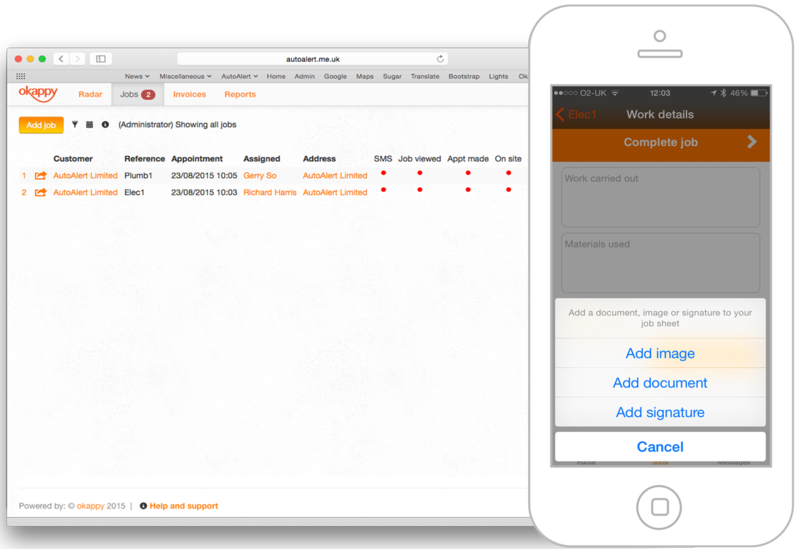 By attaching photos after work is done, it shows to customers the quality of work you've done and when it comes to sending them the invoice, the customers have all the information they need. Less chance of dispute and you will get paid quicker. 3. Another advantage of having images taken is that you can use them for your own marketing. You can often post these on social media platform like Twitter, Facebook or Pinterest for your future prospective clients. Show off some of your good work. 4. Lastly, having your customers to sign and acknowledge the work done when you are on site, it reduces the chance of future disputes. Less disputes, quicker you get paid and better customer service. Now you have all the details saved for that particular job in one place, you can easily retrieve information at any time and any where. Simple and Okappy.